Where did Susan B. Anthony grow up? She was born on February 15, 1820 in Adams, Massachusetts. She had 6 brothers and sisters, some who were also very involved in the civil rights movement. At the age of 6, her family moved to Battenville, New York where she was homeschooled because her dad didn't think the local schools were good enough. Later, life would get difficult for Susan and her family. Her dad lost almost everything when the economy collapsed in 1837. Susan started teaching to make money to help pay off her father's debts. This may seem hard to believe in today's America, but women have not always had equal rights before the law as men. In particular they weren't allowed to even vote! Susan B. Anthony was a very intelligent woman who felt that women should have the same rights as men. She saw this in the work place first where she was making about one fourth what a man would make for the same job. This didn't seem right to her. She became involved in trying to get the government to let women vote and to enact laws that women should have equal rights with men. At first she would speak at conventions and meetings. Then she helped run a civil rights newspaper, with fellow women's activist Elizabeth Cady Stanton, called The Revolution. 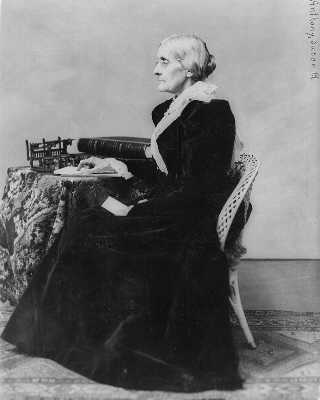 To continue her fight for women's suffrage, Susan B. Anthony voted in the November 1872 elections. This was illegal at the time and she was fined $100 for voting. She refused to pay the fine. Her defiant act of voting turned out to be great way spread the word that women should fight for the right to vote. Together with Elizabeth Cady Stanton, Susan founded the National Women's Suffrage Association in 1869. It was through this organization that Anthony would work to get women the right to vote. She devoted the next 37 years of her life to this effort. During this time, Susan made considerable progress, but it would take another 14 years after she died for women to get the right to vote. On August 18, 1920 the Nineteenth Amendment was ratified to the Constitution. It said everyone had the right to vote regardless of gender. Susan had first introduced this amendment in 1878. The B. stands for Brownell. There was a United States coin minted in her honor called the Susan B. Anthony dollar. It was a one dollar coin about the size of a quarter. The house where she was born is now the home of the Susan B. Anthony Birthplace museum. It opened in 2010. Susan was a very smart child. She was only three years old when she learned to read and write.